King Kong. Dino De Laurentiis Company 1976. Yes, this is a remake. The second remake, if an Indian version made in the 60s that stands little chance of appearing here counts. And no, I haven’t seen the original yet. I haven’t seen any version before now. This is mostly a matter of what was available, and while the newest version is old enough to be considered, I’m more attracted to this one. Just by its era, I expect it to be more accessible than the original, while still feeling more classic than current. Then on top of that, it has a particularly notable cast. Fay Wray was at the top of her career in 33’s King Kong, but she’s popularly remembered for little else now. Jeff Bridges, Charles Grodin, Jessica Lange, and Rene Auberjonois are all still fairly well known today, and I’m looking forward to their performances. The Petrox Explorer sets off for an undiscovered Pacific island hidden by perpetual cloud cover that Petrox oil executive Fred Wilson expects to find a massive deposit of oil on. Stowing away is Jack Prescott, who also suspects the island exists from his studies of a legendary hidden island in the area with a monstrous ape that he wants a chance to study. And on the way, they rescue aspiring starlet Dwan (like Dawn, but spelled more memorably) from a shipwreck. Expecting to find the island uninhabited, the expedition actually discovers a native tribe with a religion built around something fearsome called Kong and they interrupt a ritual “marriage” of one of their young women to it. The tribe decides that the white girl is a better offering for the gigantic ape, and when a trade for her is refused, they steal her off the ship in the night. A hard-fought rescue/capture ensues, as Wilson has decided to capture Kong to bring back as a mascot for Petrox so he can save face on the oil deposit that turned out to be worthless. Dwan and Kong develop a rapport, so much as Kong can be controlled at all. 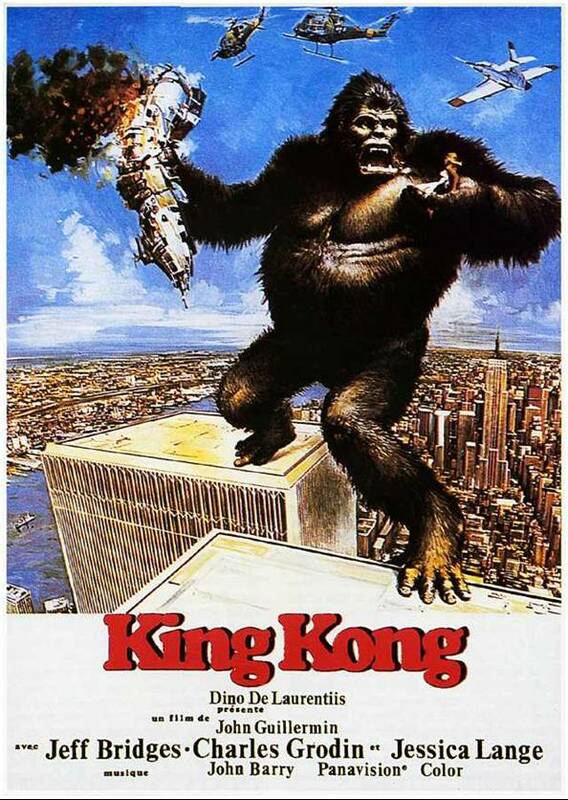 All I knew about the basic story is that Westerners go somewhere exotic, find Kong, and bring him back to New York, where a rampage ensues, and it’s all because the ape loves the girl. Also it takes longer than you expect to get to the “finding Kong” bit, which only gets worse in each iteration. Apparently the original got them there on the premise of shooting a film. Which leads me to suspect some symbolism in this version getting the girl involved by surviving the shipwreck of a yacht owned by a director who was going to give her her big break. She certainly doesn’t have any other reason to be on an oil expedition, which couldn’t be a more 70s reason to go find an uncharted island. Jessica Lange probably could have played Dwan as a stereotyped bimbo Starlet, but she doesn’t come across like that. Between the writing, directing, and acting, she feels like a caring person who happens to be a pretty girl with a fledgling career in showbusiness. Jeff Bridges too is just a guy who has reasons to be where he is and know what he knows, but isn’t defined by his profession. I wish I could get behind the ape effects more. The mechanical effects are very sophisticated, but the giant hand for Dwan to interact with feels very robotic and the body is a little too clearly a man in a suit. The face’s expressions are very nuanced for most emotions, but it seems like anything at all positive turns into a cartoonish “heeeeyyy baby” grin. I can’t say if Kong is more sympathetic here than in the original. It seems natural that a film made in the 70s would show him more as a misunderstood creature and one made in the 30s would show him more as a wild beast, but I know that the original goes out on “twas beauty killed the beast”. This is of course too directly poetic than suits this version’s tone, but I think the tone shows that idea excellently. It instead goes out on a visual that is meaningful in at least one way, possibly two, though I’m not sure about one of them. It seems like this would have an overall message, but I can’t exactly pick up on it. It doesn’t quite make a hard moral stance on respecting the exotic or nature or not trusting oil corporations. It’s just here, a tale told again out of time.